I consider the macaron to be the supermodel of cookies. The first time I had one was at Miette Pâtisserie, in San Francisco. We were staying right across the street and happened to discover Miette while walking through SF’s Ferry Building. I ended up eating an obscene amount of macarons on that trip. Although delightful to eat, these little devil cookies took a lot of effort to prepare at home. At one point we were ready to throw in the towel, thinking the cookies were going to be horribly disfigured. Luckily, it all seemed to work itself out through the baking process. Making macarons seemed like a two person job. Dustin made the frosting while I worked on the cookies. This was our first time making frosting with raw eggs, so we really didn’t want to mess that up. Watching the eggs and sugar thicken in our mixer was amazing. They changed from an odd light brown translucent color to a fluffy white bowl of delightfulness. Everything is so precise with baking. I used the imprints of a miniature cup dipped in flour for a size reference when squeezing the batter out of a pastry bag. We learned a lot about what not to do while making macarons, but even after our two mini-meltdowns, and almost starting over, they ultimately looked pretty good. 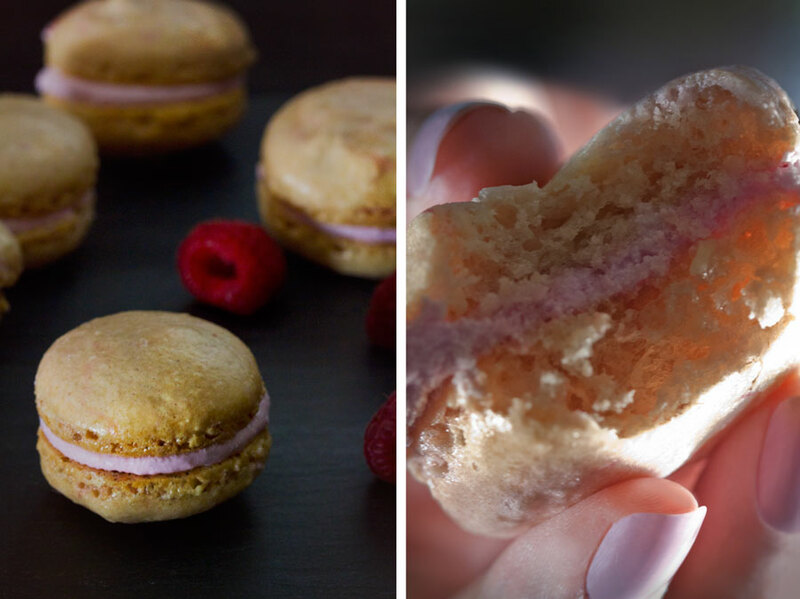 The texture seems more fluffy than store bought macarons, and they just melt in your mouth. Next time we’ll be a little more generous with our all-natural food coloring in the hopes that we can get the cake and frosting colors to match. Even though the recipe isn’t easy, I think most people would have a good chance of coming out with a delicious product that doesn’t look half bad. 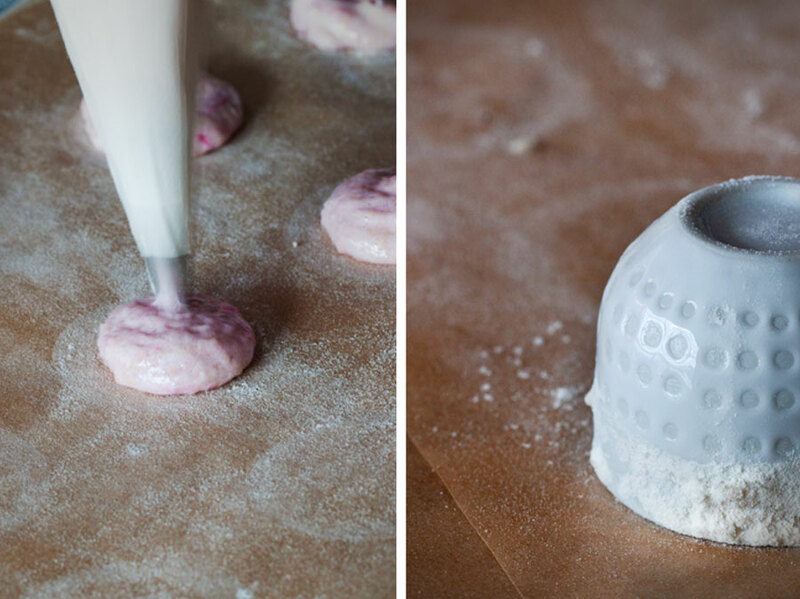 Follow instructions for French Almond Macaroons, adding 4 drops of red food coloring to the egg whites just before you add the sugar-almond mixture (batter will be pink). For the filling, do not increase vanilla, and fold 1/3 cup strained strawberry preserves (3-1/2 ounces) into Swiss Meringue Buttercream after butter has been incorporated. Proceed with the recipe. 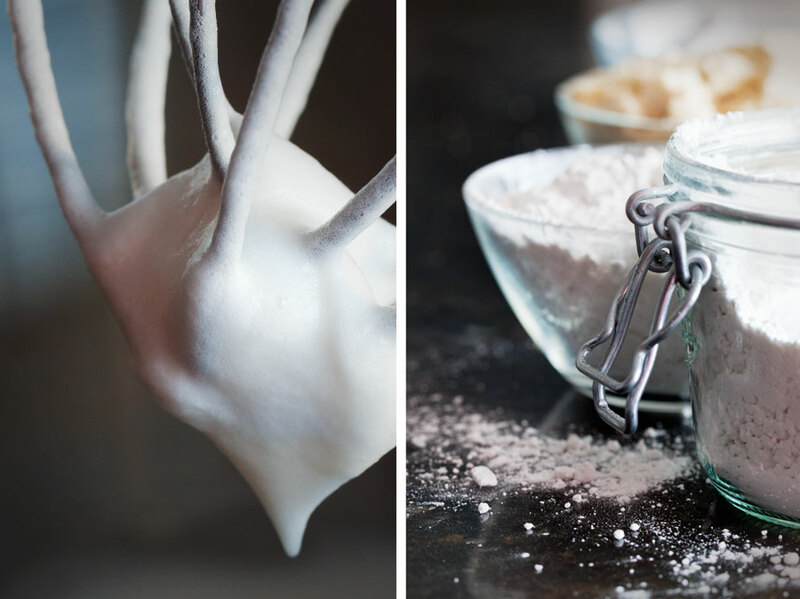 Follow instructions for French Almond Macaroons, sifting 2 tablespoons Dutch-process coca powder with the confectioners’ sugar. For the filling, place 5 ounces finely chopped semisweet chocolate in a bowl. In a small saucepan, heat 1/2 cup heavy cream until it just starts to simmer; pour over chocolate. Let sit for 1 minute; stir until melted. Let ganache stand at room temperature until thick enough to spread. Proceed with the recipe. 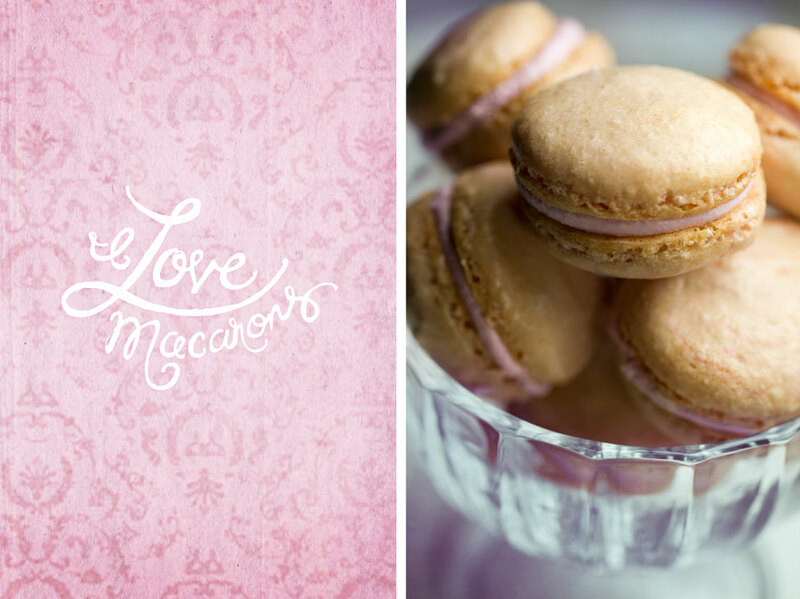 § 2 Responses to Devil Macarons"
What a sweet little cookie….I should of made those for Valentine’s Day. I guess any day is a good day for COOKIES! They are so light and fluffy. I ended up cooking a 4 course meal for Dustin on Valentines day. That will be in the next post. Surprised I pulled it off.